Near the end of the second world war, the Chase company proposed a radical assault glider. All metal with a cargo hold larger than a C-47's complete with a ramp door under the upswept tail, the XCG-20 was like no other assault glider ever produced. It was to be reusable, and that meant that it needed to be able to take off from the assault zone after the battle. It wasn't long before someone had the bright idea that if it had engines of its own, it wouldn't need a towplane to help it take off, and thus it followed in the footsteps of the Gotha 242 and Me 321 Gigant assault gliders. Once equipped with its own engines, it could fly itself to the assault, land and take off again. This capacity did not escape the USAF planners' notice and very quickly the glider variant was cancelled in favour of engines. Only one glider was ever produced. Interestingly, the USAF's first jet-powered transport was a C-123 variant, but the straight wing and thirstiness of the J-47 engines rendered it less capable than the piston variety and thus it, too was a one-off. In complicated post-war manoeuvring, the Chase Company lost the design rights, which were acquired by Fairchild, and thus every C-123 produced wore the Fairchild name. The basic C-123B was developed and modified into several variants, some carrying podded auxiliary jet engines under the wings or attached to the wingtips. The C-123's most infamous use was the “Ranch Hand” Agent Orange sprayers in Vietnam. 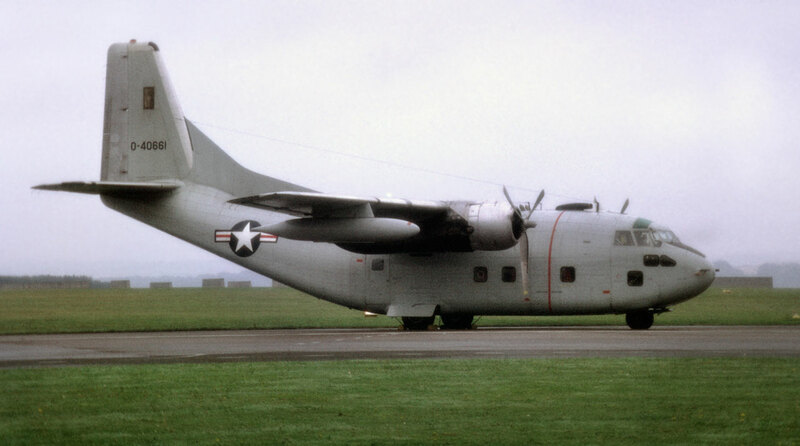 The C-123 has enjoyed a fairly successful cinematic career, starring in Air America, Con Air, Operation Dumbo Drop and masqueraded as an AN-12 and C-130 respectively in The Living Daylights and Die Hard 2. This kit is very nicely moulded in Roden's familiar slightly brownish plastic. There is a fair amount of flash and several ejector pin towers on the backs of some of the parts which will need removing. There are some stress marks on the left fuselage half corresponding to the ejector pin locations. Either the plastic was slightly too warm, or it stuck in the mould a fraction of a second too long. Either way, I don't think they will cause any difficulty during building. This kit reveals Roden's limited-run nature more readily than others in their catalogue. The panel lines are very nicely engraved and are remarkably consistent over the entire surface of the model. They also match up very well on the fuselage halves, top and bottom. The fuselage is two pieces nose to tail with a separate freight door. It is moulded shut, but can easily be cut and glued open. The personnel doors are also moulded shut, but the internal engraving is deep enough that they can be cut away from the fuselage sides with ease. The interior is quite complete, even down to some frames and pipes in the ceiling which will be visible if the ramp is left down. The cockpit consists of seats, yokes, centre and side consoles with nicely raised detail and an equally detailed instrument panel. The rear cockpit bulkhead gets a pair of fire extinguisher bottles (or perhaps they're hydraulic accumulators) and some handrails, ladder and boxes on the side which will be visible in the cargo bay. There is an overhead console to fit into the canopy/cockpit roof. In contrast to the rest of the cockpit, it's featureless but this is likely because it's not going to be very visible once the cockpit roof is installed. Detailers may wish to play a little here. The underside of the cockpit floor is the roof of the nose wheel well to which sides and details are added. There's not a great deal of room for nose weight. The instructions call for 20 grams to be added into the separate nose cap. Perhaps some of that can be squeezed in between the nose gear bay and the fuselage sides before gluing the nose cap in place. Neither the nose nor the main landing gear struts may be left off to ease construction, although perhaps the wheels can be added after painting, which will make masking a little less of a chore. Each wing is constructed from a top and bottom half. The joint to the wing roots looks to be sturdy enough. Holes will need to be drilled in order to fit the underwing tanks; these are moulded as flashed-over holes which make locating them properly much less uncertain. There are a couple of small ejector pin towers which need planing off before the wing halves can be glued together. The landing lights are single pieces of clear plastic which fit into each wing's leading edge. It wouldn't be terribly difficult to add a little detail behind them to show the actual lamps. The tailplanes are two piece mouldings with large ejector pin towers on the inner faces which must be chiseled and sanded off in order for the halves to fit together. Given the construction, then may be left off until after painting and decalling although the kit scheme will not require it. The elevators are not designed to be poseable, but most photos available on the net show the control surfaces in neutral when the aircraft is parked. They'd need a bit of surgery to be positioned deflected. Each R-2800 engine is made up of two complete rows of cylinders (in front and rear halves, complete with ejector pin towers to liven up your day) plus exhaust collectors, rear accessory case, baffle and reduction gearbox cover for the engine front. Once assembled, they'll look quite busy. All they really need from a standpoint of extra detail is ignition harnesses. The engine cowlings fit to nacelles made from top and bottom halves which then glue to the lower wing surface. The C-123's glider heritage is still evident (Interestingly, the C-123's nacelles are also the aircraft's main fuel tanks; no tankage was built into the wings, another carryover from its glider ancestry). The exhaust pipes are moulded solid, but they're large enough that drilling them out will be comparatively easy. Replacing them with plastic or brass tubing is another possible option. The landing gear struts and wheels have adequate detail for the scale. They will need only a good painting before they can be glued in place. The bays could use some plumbing if you're so inclined, but the wheel well openings are rather small, and mostly filled by the wheels so doing too much would be a case of overkill. I don't compare models to drawings or published measurements. When assembled it looks like a C-123. 2 C-123B 56-4362 of the Republic of Vietnam Air Force, 1964. This aircraft carried the name “Patches”. Each aircraft is overall natural metal with black and dark grey details. The sample kit's decal sheet was smudged during printing. One of the USAF insignia is unusable and one of the American flags for the Air America scheme is borderline. The rest of the sheet looks like a typical Roden decal; slightly fuzzy but with good solid colours. Finding replacement USAF insignia is not difficult. Finding a properly sized American flag may be a trifle harder. Since every other Roden decal I've ever owned has been clearly printed, I am willing to dismiss this as a one-off occurrence. The decals were printed with Roden's “new” process so they will behave somewhat better than those of Roden's formative years. The marking schemes are simple enough that most of the decals may easily be replaced by generic aftermarket sheets if you are leery of using the kit's decals. There were come very colourful C-123Bs in service, including a Thunderbirds support aircraft in full team markings. One hopes that Roden or the aftermarket will make some of these schemes available in the future. Even though it's a limited run kit, it's a huge improvement over the Mach 2 kit, which is the only other injection-moulded 1/72 C-123. A representative C-123B wearing a paint scheme similar to the kit options. Highs: The best injection-moulded C-123 yet produced. Excellent panel lines. Lows: Some flash and ejector pin towers. The decals and painting options could be better. Verdict: This kit will fill a void in any cargo aircraft fan's collection. Somewhat surprisingly it's not really that large. A Lancaster has a longer wingspan, and a Stirling has a longer fuselage. What it is, in contrast with aircraft of its day, is chubby. It's at least twice as wide as a Dakota, perhaps even 2 1/2 times. Actually, I reffered to the typo in your first post. But it's good to know that it is not such a big aircraft. Sorry, I have numerical dyslexia. I very often totally mix up numbers. Dyslexics of the world: UNTIE! I would love this model. It is one of the few Cold War acft that I like. Dunno why, I just do.